I know this sounds weird, but I have a soft spot for Pit Bulls. With Demodex. Canine Demodex is a type of parasite that mother dog passes directly to her offspring. The mites embed in the skin or hair follicles, lay eggs, and live their parasitic little lives, I guess. I’m told the condition isn’t as itchy or uncomfortable as it appears, but the effect is a scabby, diseasey-looking, and bald (in places) little pup. Though treatable, it’s not exactly what most potential adopters are searching for. 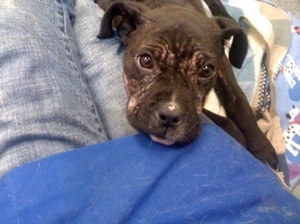 We don’t see Demodex all that much in Santa Fe, but in San Francisco, it felt like every unwanted Pittie pup who arrived at the shelter was infested. I developed a fondness for the dogs who had it, growing to love even its singular musty odor. So when this forlorn little guy showed up at SFASHS, it was naturally love at first sight/smell/diagnosis. He’s been at the shelter a week or two now, receiving medical care and learning how to interact with people. Each time I visit his kennel, I fight the urge to smuggle him out under my coat. Luckily the weather’s turning warmer. And he’s already outgrown my pockets.